Put down your pitchforks and get back to your homes. Now, where's my bride. OK, OK, who's got my goose? Shhhh. Don't worry. Of course I'll raise taxes on everyone and get us out of Iraq. You just can't tell anybody yet. Hey, hey, hey! Don't shake your fists at ME! It was your damned primary that got me the nomination! The Internationale unites the human race"
"Nope...no more Botox for me today. Thanks anyway..."
I'm open! Throw me the ball! Sit down. Please sit down. When I say we're in this together, I don't mean I actually want us to BE together. Jeez, I didn't really shoot the goose before I pretended to have shot the goose. Don't get your down in a bind there. 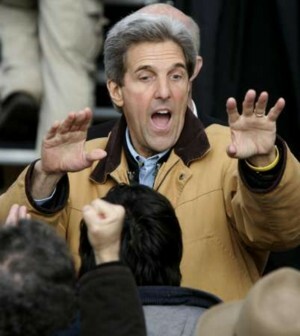 John Kerry practicing his "Arise and walk!!" routine to prove that Edwards wasn't lying about the stem cell stuff. "This is my seven point plan for getting us out of Iraq"
"Give me that AK-47! Theres a Republican in the audience!" Rise, Christopher Reeve, and walk! "Give me back my lucky CIA hat!" "Put 'cha hands in the air, an' swing 'em like ya just don't care." "Please, folks, for God's sake, stay calm! Just hold on until after Tuesday and we can hose out the White House and get things back on track." "I'm on your side, whichever side you're on!" "It's just a jump, to the left!" "Toss me that crow and I'll catch it in my mouth!" "calm down, I said I had the better flan, not a better plan!" This is the way I scared off VC when I was a young man and this is how I will scare off terrorists if I am elected president. Raaaaarrrrrrrrr!! "A little bit softer now"
"Please, folks, a little order here! Mr. Rove is still holed up in his office and refuses to clean out his desk and leave. We at least owe a little compassion for a guy as traumatized as he is right now." Hey man, back off, this is Teddy's boy toy! The guy with the crack cocaine will be here in twenty minutes. No ! No ! I swear, the Beatles have checked out!